The Hemorrhoid Cure Kit is a traditional Chinese medicine based two factor hemorrhoid relief product. It is intended to provide relief via herbal anti-inflammatories, pain relievers and a calming ointment. Our research discovered that the Hemorrhoid Cure Kit is marketed in such a way that it is almost impossible to live up to its own standards. It is claimed to be the highest quality, easiest to use, and provide the longest lasting relief. Our researchers decided to see how much these claims had going for them. However, none of these ingredients are clinically shown to be effective for anything that is remotely helpful for those suffering from hemorrhoids. After cleaning the area, apply the paste evenly around the affected area twice a day. 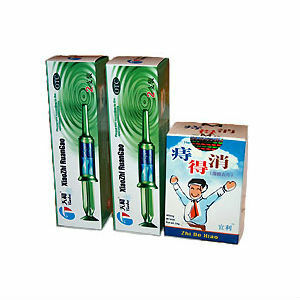 Three tablets a day is the recommended dosage for the Zhi De Xiao aspect of the Hemorrhoid Cure Kit. The Hemorrhoid Cure Kit contains 4 syringes containing the paste and 60 tablets for $29.95. Compared to similar products, the Hemorrhoid Cure Kit is heavily underpriced, leaving a lot to be concerned about. Throughout our research we learned that only the products shipping is covered by any kind of guarantee. The Hemorrhoid Cure Kit has not proven itself through our research to come even close to beating the top products. The ingredients found in the Hemorrhoid Kit are also sub par, lacking any kind of proper, credible documentation. John Parker	reviewed The Hemorrhoid Cure Kit	on October 22nd	 and gave it a rating of 2.